Companies spend huge dollars attracting and keeping clients—and this is certainly true for apartment owners. The operator who values customer retention should be asking, “Where is my tenant moving to and why?” Per Freddie Mac’s recent survey of renters, of those planning to rent their next home, 45% indicated they prefer to move into a single-family detached or attached rental home (“SFR”). Why? Only 11% of apartment units are 3+ bedroom homes. Over 65% of SFR homes have 3 or more bedrooms. And single-family homes offer other advantages. Our market surveys show that SFR tenants strongly desire the privacy offered by a single-family home with a yard, and they really don’t want to have someone live above or below them. Diversification. As most investors should build a diversified portfolio by product type and geography, so should you. Demographics drive housing rental demand beyond the economic cycle. Your rental portfolio could be enhanced by providing an array of product types to satisfy a diverse tenant profile. By offering product to suit renters at key life stages, you can leverage your operational infrastructure and retain more tenants as their housing needs change, which should help maximize profitability and mitigate risks of shifting demographics. 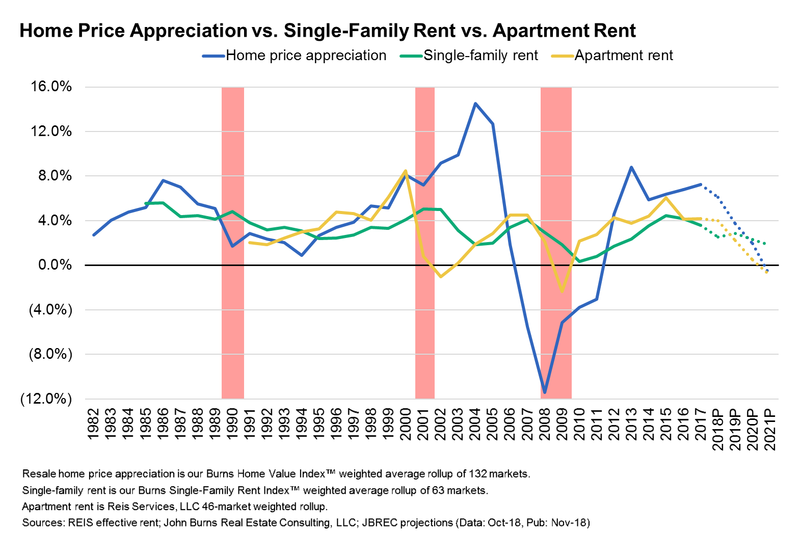 Institutionalizing single-family rentals. The multifamily industry was unsure of the economic viability of institutionalizing single-family rental homes. However, institutional owners of SFRs have effectively leveraged technology to make leasing, managing, and maintaining a portfolio of homes spread throughout a city cost-effective and profitable. Now think, what if these SFR homes were grouped together? Dedicated build-for-rent communities: the next evolution in SFR. As the SFR industry continues to grow and evolve, SFR portfolios consist of both existing resale homes as well as new, build-for-rent housing (“BFR”) communities. We believe dedicated BFR communities are a natural addition to a multifamily company’s portfolio of apartment units. The operation of a concentrated BFR development can be very similar to an apartment complex. Furthermore, our market research has found that developers of BFR communities who have approached management, marketing, and maintenance using methods employed by Class A apartment owners have achieved some of the best absorption rates and rent premiums in the space. BFR offerings have been enthusiastically accepted by households looking for rental homes. These tenants are willing to pay a premium to combine a single-family home’s privacy with the services of an apartment community. From an operational perspective, BFR communities have many competitive advantages. Rent premium. Most BFR communities are able to command premiums over comparably sized stand-alone single-family rental homes and apartment units. That premium can be as much as 30%, but of course it varies widely based on product, community amenities, and services provided by the BFR operator. Solid rent growth. 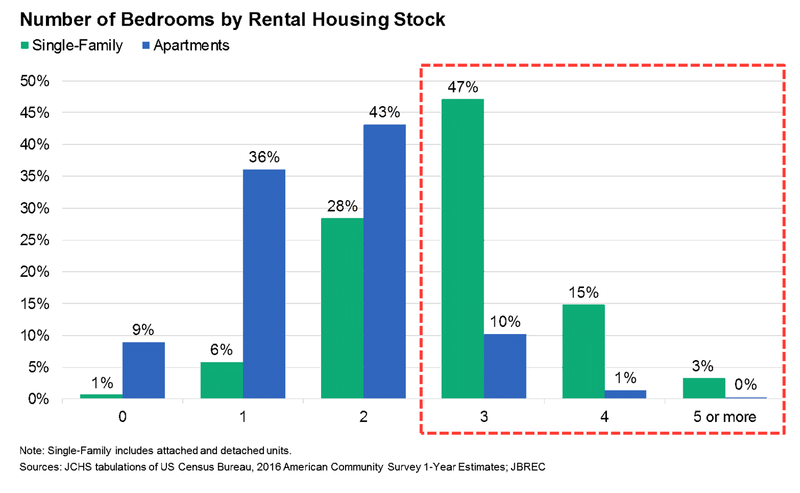 Rent growth for SFR REITs in the past 12 months has averaged 4.5%, above the 3.0% for multifamily REITs, on stabilized occupancy levels of 96% in the latest quarter (the same level as multifamily REITs). On a national level, single-family rental rates never experienced negative growth. Even during the Great Recession, SFR rent rates were less volatile than apartment rents and resale home prices. Reduced turnover. With lower turnover than apartments (approximately 30%–34% for SFR vs. about 47%–51% for apartments), total costs associated with turnover are also lower. Benefits of new construction. New construction will provide lower repair, maintenance, and capex costs relative to older single-family stock for up to 15 years. Planning and building single-family homes for rent allows the use of materials, technology, and structural design to minimize future maintenance costs. BFR communities average about 130 units, with the largest comprising over 450 units. Lot size for single-family home renters is not a critical factor, and limited premium is attributable to larger lot sizes. Increased density should not materially impact revenue in most markets. Absorption typically ranges from 8 to 10 units per month, with the best operator achieving up to 35 units per month when properly marketed. Typical cap rates for BFR communities range from 5.0% to 6.5%. BFR communities are often built in desirable locations, sometimes adjacent to new for-sale projects, including within master-planned communities. BFR amenities and services. Operators are employing different strategies ranging from providing Class A apartment-level services and amenities to having little of either. The full-service model starts with on-site leasing experts supported by up to three (3) model units. Residents also typically benefit from on-site property management, 24-hour maintenance, lawn service, and trash valet. Amenities can include gated entrances and private streets, pools, and parks. The other end of the spectrum lives like a traditional single-family detached neighborhood with virtually no amenities or on-site services. Don’t miss out. 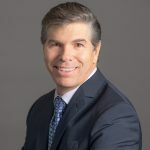 Multifamily owners can leverage their existing capital structure and operating platforms to find sites, build homes, manage leasing and operations, and provide great programming and reliable customer service to retain tenants with changing housing needs. We can help you with everything else, from identifying the right market or site to targeting the right customer and building the right product. We have been involved with the SFR industry since 2010, helping on portfolio acquisitions, IPOs, and now BFR communities. When we conduct Burns Plus Feasibility studies, whether for rent or for sale, we are careful to survey the likely occupants, recommend the appropriate specification level, and often use photos from DesignLens™ or neighboring communities. If you would like additional help in evaluating the BFR space, please reach out to us. If you have any questions, please contact Don Walker, Managing Principal and CFO at (858) 281-7211 or by email.